RV.Net Open Roads Forum: Class C Motorhomes: Freelander 21QB owners? I will not be able to personally inspect this for a couple of months, but hope to be up to speed to commission/outfit it for boondocking when I meet her in person. We own a 22QB with the Ford V10. Believe it's about the same but the dinette and closet/pantry area slide out. Assuming the previous owner did not do so, "right away" you will want to seal the 3 amber colored front-facing lights at the top of the cab-over bed, and the one on each side. They are prone to leaking in significant amounts of rain water and snow melt, destroying the cab-over area. By the time the owner sees water stains, lots of damage is already done. Also inspect the seam-work in the same area for the same concerns. At 23.5 feet bumper to bumper, the 21QB is a sweet little rig with an efficient floor plan. I hope you enjoy it. 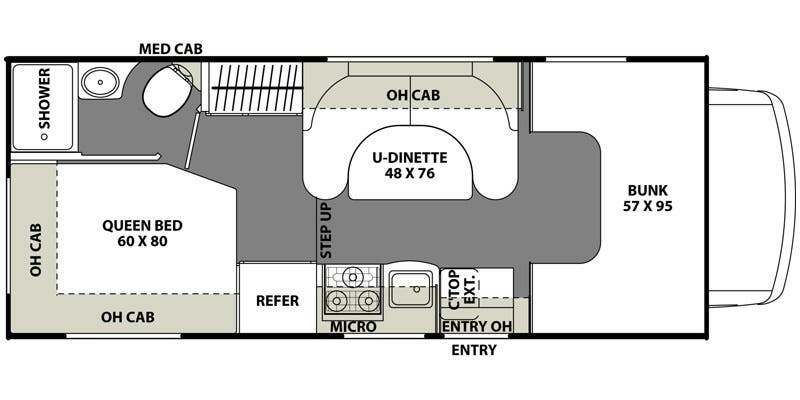 It's the same floor plan as our rig minus the cab-over bed. Our rig is a B+, working perfectly for my wife and me 12 years running. i have a 2011 21 qb on ford. the big complaint i have is the corner bed. i hate that. the bathroom is small but useable. as said before the cab over is prone to leaks due to the flexing so be vigilant. wish i had a slide out. I have a 2011 21QB on the Ford. The big complaint I have is the corner bed. I hate that. The bathroom is small but useable. As said before, the cab over is prone to leaks due to the flexing, so be vigilant. I wish I had a slide out. But with a slide out, your house will be flexing even more. I agree that the rear corner bed is less than ideal yet we work with it well. For us, it's better than the alternative.....no motor home at all. Our rig just barely fits in our garage as it is. And it's easy to get around in and find campsites in the national parks and such. Staying in private RV parks far away from the action because of "excessive length" is so much worse than a corner bed. A rear corner bed is just about the only way to have an always-available, nearly queen size, bed at floor level in a small Class C without slides. The DW has no problem using our rear corner bed because she is the only one who sleeps in it due to her needing the whole thing to spread out with her bad back. I use the cabover queen, which is easy to get into due to the raised floor of our basement design coach and it's stock ladder with wide steps that Winnebago supplied. There is no need to "make up" the corner bed. We just use a foam topper on the corner bed and then wash/change it's fitted sheet periodically. The fitted sheet is easy to put on/off by curling the topper's corners towards the foot where we stand, as we stretch the fitted sheet's elastic edges over onto/off-of the underside of the foam. Use of the corner bed this way is not difficult at all, and what effort it is - is well worth the advantages of a small Class C with no slides. Has anyone installed an inverter? Where did you locate it? Don't know about the 2012 but my 2019 has a plug-in outside for solar to be attached.